- Widely used in TV, automobile electronics, pc cards, electronical meter, DVD, MP3, MP4, etc. This set is organized by size in a transparent storage case for quick access and protection. Usage:Widely used in TV, automobile electronics, pc cards, electronical meter, DVD, MP3, MP4, etc. Frequency Tolerance: ±20ppm, Frequency Stability: ±20ppm, Load Capacitance: 20PF. 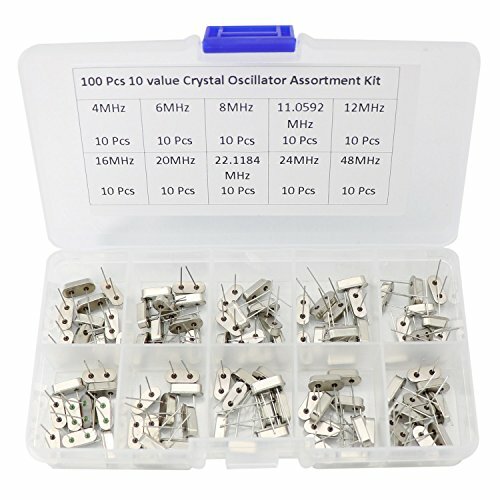 Packed:100 pcs Crystal Oscillator come in a handy box with different molded area. Box will not break easily, parts inside will not slide or move around. If you have any questions about this product by Zovfam, contact us by completing and submitting the form below. If you are looking for a specif part number, please include it with your message. Electronics-Salon Quartz Crystal Resonator Assortment Kit. 10 values each 5pcs: 4 MHz, 4.096 MHz, 6 MHz, 8 MHz, 10 MHz, 11.0592 MHz, 12 MHz, 16 MHz, 20 MHz, 24 MHz. Oscillator.